A swelling prison population is money in the bank for Wells Fargo, one of the top shareholders in GEO Group, the second largest prison company in the country. 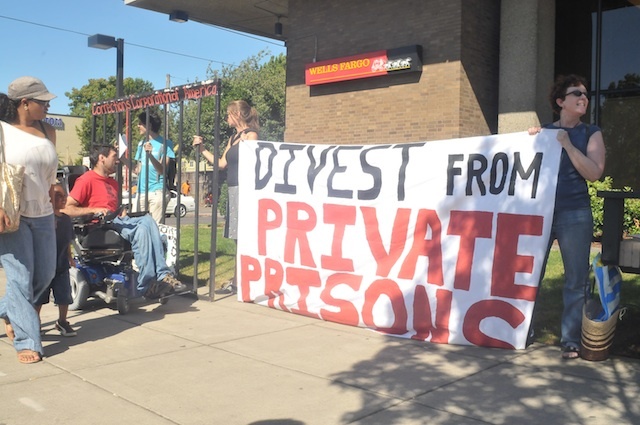 In their continued campaign to urge the company to divest from the for-profit prison industry — particularly Geo Group and Correction Corporation of America — over 20 people amassed outside the Wells Fargo branch on NE MLK on August 3. Talking with bank customers and passersby, the protesters handed out “coupons” for $100 free checking when opening a new account and providing “proof that you had a person of color arrested and detained through one of our Private Prison Partner Corporations”. 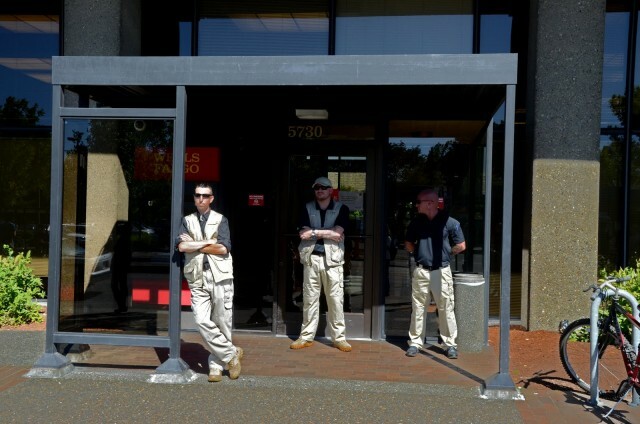 The ongoing campaign began with an affinity group from the Portland Central America Solidarity Committee (PCASC) occupying the Wells Fargo branch on SW 5th Avenue during the Occupy the Banks protests on November 17, 2011. Since then PCASC has partnered with other community groups, including Enlace, as part of the national Prison Divestment Campaign to force Wells Fargo’s divestment. As of March 2012, Wells Fargo owned over 4.7 million shares in Geo, representing 7.7% of its stock, at a valuation of nearly $90 million. In addition,, the Wells Fargo Advantage Small Cap mutual fund reported in May that it owned over 2.7 million shares worth more than $60 million. According to Jake Dacks, one of the protest organizers, Wells Fargo hires the same lobbyists as Geo does in order to enhance existing legislation, as well as create new laws that result in more prison time for offenders – often people of color, particularly those without documentation. These laws, along with inhumane measures such as cutting money used for health care and food, result in greater profits for Geo and Wells Fargo. Interested in pushing Wells Fargo to divest from the private for-profit prison industry, as well as getting the profit motive out of prisons? Visit www.pcasc.net. PCASC meets at 2249 East Burnside Street at 7 pm on the 1st and 3rd Wednesdays of every month. Celebrating Wells Fargo’s 160th Birthday! Celebrating 160 years of empire building and oppression! According to SEC filings recently made public (see below), Wells Fargo has divested nearly 75% of their holdings in Geo Group, the nation's second largest private prison company.